After such a rainy early summer, it has finally dried up. It’s supposed to be sunny for a whole week so we’re making hay like crazy. Will baled up two small fields with the big round baler then went on to cut a very big field. He cut all day and finally finished up by bringing home a transport load of bales that he had baled earlier. But all is not perfect on the Clay-Atkinson homestead. Last Friday, I went to town to buy Will more baling twine and since gas is fifteen cents cheaper there than locally, I let our truck run to less than a quarter tank. I got the twine, then stopped to fill up the pickup. I squeezed the nozzle and gas gushed out beneath the truck. I replaced the nozzle, thinking somehow I must have screwed up. But with a little squeeze, more gas splashed to the pavement. (I only dumped about a pint on the ground but was horrified!) Knowing I had a major leak in the gas tank/filler tube, I got in the truck and headed home — 32 miles away. As I left town, the “low fuel” light came on. I called Will, who was on the hay field and told him what happened and told him the route I was taking home … just in case — there are some areas with no cell phone reception I had to pass through. I said a quick prayer and headed home, trying not to look at the gas gauge. Whew! I made it and parked the truck off the gravel driveway where Will could crawl under it. To make a long story shorter, not only was the gas filler tube shot, but when Will pushed up on the gas tank the remainder of the gas poured out on him. So we have to replace the gas tank, the filler tube, and pressure switch, which is made of plastic and when Will tried to remove it from the old tank, of course it broke. The reason the filler tube broke, besides being rusted out, was that the box of the pickup had rusted so badly it dropped down onto the filler tube. So Will is in the process of hoisting the box up and shoving in oak 4x4s to hold it up, plus all the bolting, screwing, etc. that goes with such a repair. (Okay, sometimes I do lust after a newer truck.) But we’ll get this old ’99 back on the road sometime soon and not have horrendous truck payments. This is our big Sweet Dakota Rose watermelon, the size of a soccer ball. Our melons are terrific this year. 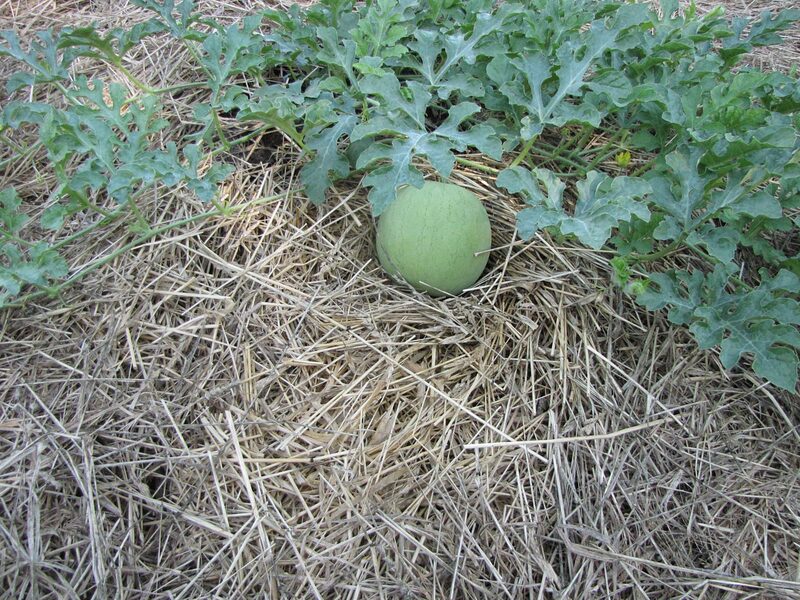 We’re trialing several new muskmelons and watermelons and all are doing very well. In our main garden, we’re growing a longer season muskmelon, Oka, and it’s doing very well, with larger than softball sized melons. 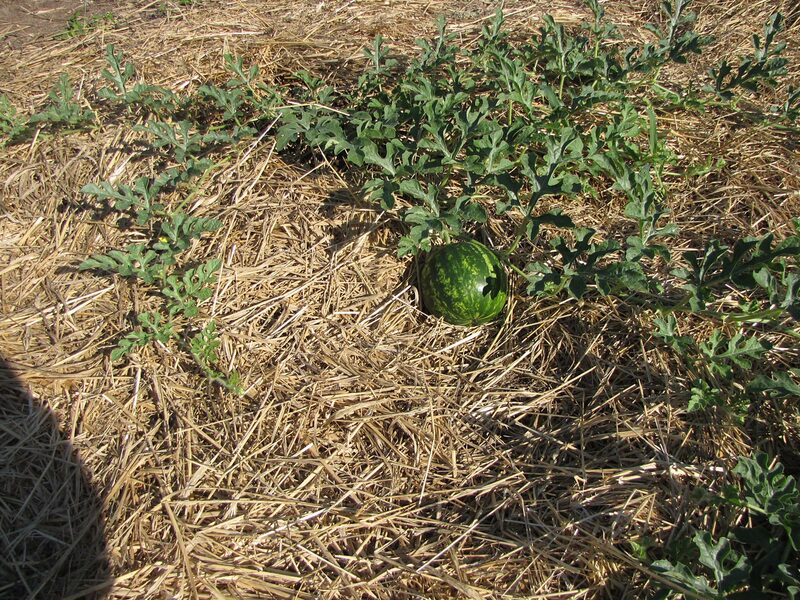 In the Sand garden, we’ve got soccer ball sized Bozeman and Katanya watermelons, as well as various new muskmelons. Meanwhile, our super-girl, Alisha, has gone home for awhile. Boy, do I miss her enthusiastic and fun presence! She has some family commitments and has to fly to Seattle. So today I picked a basket and half of Provider beans and am busy canning them up. And Bozeman doesn’t fall far behind; with 12 more melons set on three vines! We have had to replace all that before on our pickup. A lot of work but I thank God for a husband who is knowledgeable enough to do the repairs himself. I know you must feel the same way about Will. Do you have any articles about building green houses? I have anthologies 1 – 26 in my collection of reading materials. Not really, David. But the good news is I’m working on one right now so that should help you plan for next year. I don’t know about “awesome”…we call it poor. But we hate debt so very much, too. Your Very Wild Black Cherry Jam sounds yummy! I do love a sweet jam with a kick! Thank you for sharing the good and the bad of your days with us. You remain an inspiration for anyone desiring a life well spent! I used some Muy Bronco Black Cherry jam in my stir-fry last night. Boy was THAT good!!! Good news too; the truck is back on the road. Yahoo. Oh the trials we go thru with vehicles!! I spent two days canning salsa, just one batch, but being disabled, takes me longer to get thru it and recover. Then today hubby brings in a basket of poblano peppers,more cukes, and banana peppers! sigh! lol! might just dry the peppers, am thinking easiest way to go when our week is filled with dr visits down in Omaha this week and in the 90’s, yuck!! Ginger, I live in Omaha. We certainly have had a different weather year haven’t we. Because of many reasons, I didn’t have much garden this year. I’m glad to hear that yours is doing well. Those dry peppers are so very useful too. Can’t live without them. And you’re right to pace yourself. I just love hearing about all the things you do on and around your farm, the trials the tribulations, etc. Im a small town girl and long for the farm but being single and not in the best financial health, i guess ill just keep dreaming of owning a small farm someday. I hope your dreams will be real one day. Do everything you can to improve your financial health. It is a struggle but it can be done. Been there; done that! Then creep toward your dream homestead until you can run through the pasture grasses!